Deep in the darkness of the jungle lies great danger, but for those brave enough to venture through the depth of the mysterious jungle, great rewards await. A brave female ventures into the jungle and meets a noble savage. If it were not for him, she would have certainly perished, but instead, he leads her away from her betrothed and takes her to great riches. Together they walk the jungle trail and find a wealth of bonus features like expanding symbols, payment boosters, and unlock many achievements together. Playtech now invites you to join the explorer and the noble savage into the jungle. The adventure is made up of five reels and three rows, with a total of 50 paylines to win on. Heart of Jungle is a medium volatility adventure with an RTP rate of 94.91%, so you can expect some nice wins relatively frequently. 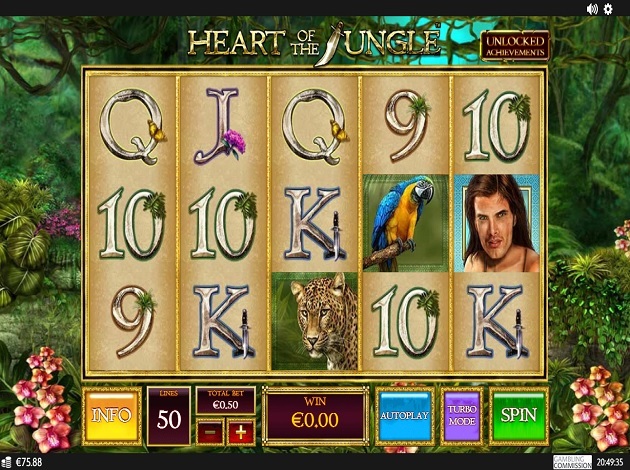 Heart of the Jungle can be played with bets ranging from a minimum of € 0.5 per spin to a maximum of € 100. Once your start spinning the reels, you’ll see the main symbols which include the savage male, the female character of the story, a monkey, elephant, leopard, and parrot. There are also six playing card symbols decorated to fit the jungle theme. The wild symbol is the game’s logo, and this substitutes for all symbols except for the scatter, which is a forest mask symbol. Three scatter symbols landing on reels 1, 3, and 5 will trigger the Jungle Trail free spins. Now you’ll be shown a tattered old map, where of course, X marks the spot. There are five treasure spots on the map, with bigger prizes to be won as you progress along the map. Lake Zantar: The first entry to the bonus earns you eight free spins with a 5x win multiplier and an Ultra Spin. An Ultra Spin can win you up to 25x your bet! Crystal Falls: These are triggered from the fifth time the Jungle Trail free spins are won. Now, you get 10 free spins with shifting stacked wilds – up to four wild stacks can appear on any spin! The Golden Mountain: You’ll reach this level from the 10th time the Jungle Trail free spins are triggered, and you will win 15 free spins with nudging wilds and reversing reels. The Lost City of Zantar: This level is available when you trigger the Jungle Trail free spins for the 25th time. Now, you’ll win 25 free spins with a rising multiplier and shifting wilds. Payment Boost: If you manage to make it to the mysterious fifth location, you unlock the payment boost! The Payment Boost unlocks an even better free spins round with boosted payouts. Heart of the Jungle is a game that rewards you more and more the longer you play. There are 63 achievements to complete, allowing you to be part of the story from start to finish and giving you some extra rewards too. The game’s logo (wild) symbol is the biggest reward you can find in Heart of the Jungle. For three wilds, you get 2x your bet whilst for five of a kind, you get a good prize of 40x your bet. The savage comes with a top prize of 10x your bet, whilst the female can earn you up to 4x your bet. The animal symbols earn you anywhere from 0.2x your bet up to 2x your bet. Finally, the lowest paying symbols are the playing card symbols, A to 10. Heart of the Jungle is one of the most immersive, engaging slots out there. When you load the slot, you’re greeted by a short trailer introducing you to the story. If you’re curious to know how this Tarzan and Jane inspired story goes, you can actually read the full story through the information button in the game panel. The amount of detail put into this slot is nothing short of jaw-dropping, and you can’t help fall in love with it. You will even find extract from the personal diary of the female character, recounting every part of her journey through the jungle trail. As you play, you’ll hear the soothing sounds of waterfalls, birds chirping, and various animal sounds. Heart of the Jungle is the kind of game that is entertaining to play even if you’re playing just for fun! With real bets involved, this Tarzan and Jane inspired slot is a truly exciting experience. It’s the kind of game that rewards you more and more the longer you play for. Take a walk on the wild side right here at Videoslots.com and play Heart of the Jungle today.